Hadrian's Arch (in Greek: Πύλη του Αδριανού, Pýli̱ tou Adrianoú; also known as the Arch of Hadrian) is a famous gateway in Athens. The Arch serves to distinguish the center of Athens from the former Hadrianopolis, indicated by two inscriptions on the arch. Luigi visits it in Mario is Missing! when it gets attacked by Koopa Troopas, who steal the Arch's Brass Plaque (holding one of the inscriptions). 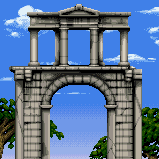 Luigi's task is to find the Plaque, which he eventually does, and return it to the Arch, which he does through its information booth while also answering questions about the Arch (seen below). Fallen arches are not pretty. For whom did they name the arch and the new Roman city? What other famous arch does this one resemble? The Roman Emperor, Hadrian (117 - 138 AD), commissioned the building of the ornate arch. The arch separates the ancient city of Athens from the Roman city he built there, Hadrianopolis. The arch, made from pure white marble, was completed in 131 AD, and resembles the French Arc de Triomphe. Two brass plates affixed to the arch say it all: On the west face, the inscription reads, "This is Athens, the ancient city of Theseus"; while on the east face, the inscription reads, "This is the city of Hadrian and not of Theseus".